WATERLOO – Wilfrid Laurier University has achieved a silver rating in the 2015 Sustainable Campus Index, which recognized the university as a top performer in the Coordination & Planning category, as well as a Rising Star. The 2015 Sustainable Campus Index highlights top-performing colleges and universities in 17 areas, as measured by the Sustainability Tracking, Assessment & Rating System (STARS). Laurier first completed the STARS assessment in 2010 and again in 2014 to measure progress, which proved to be sizeable, earning the university the Rising Star recognition. Laurier placed in the 100th percentile for the Coordination & Planning subcategory, which recognizes institutions that are dedicating resources to sustainability coordination, developing plans to move toward sustainability, and engaging the campus community in governance. “We are incredibly proud to be listed in this year’s annual review of top performing institutions, particularly in the subcategory of Coordination & Planning,” said Gary Nower, assistant vice president, Physical Resources. With more than 700 participating institutions, STARS is the leading tool for measuring higher education sustainability performance. STARS evaluated reports from 112 institutions this year, a seven per cent increase from the previous year. Submissions from Canadian institutions doubled in comparison to last year. 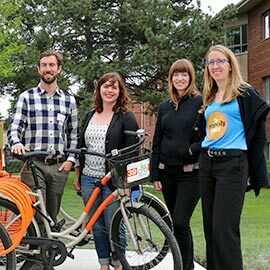 Laurier continues to demonstrate significant commitment to advancing sustainability efforts including the newly launched CAB Bike Share Station on the Waterloo campus. This initiative provides affordable access to bicycles as alternative transportation to students, staff, faculty and community members. Another newly launched effort includes the Sustainable Hawk Fund. The Laurier Sustainability Office has dedicated up to $20,000 annually to help grow sustainability ideas that benefit the Laurier community. The objective is to leverage Laurier's entrepreneurial and community spirit by engaging students, faculty, and staff to integrate sustainability practices into all aspects of student life at Laurier. For more information about sustainability efforts at Laurier, visit wlu.ca/sustainability.